Athlete's Arena's Life Performance Personal Training is designed with your quality of life in mind. Feel Better, move better, with a stronger body and a stronger mind. Are you tired of the same routine of 30 minutes on the elliptical, stairmaster or stationary bike, without seeing any measurable results? Athlete's Arena offers you a different kind of workout, one that changes regularly and will produce results you can see and feel in a short amount of time. We won't bore you with long periods of cardio, instead, you'll get a full body workout that is not only heart-healthy, but builds muscle as well. Studies show that adults who are physically inactive lose as much as 3 - 5 percent of their muscle mass per decade after age 30 (Dr. Axe - Food is Medicine). This leads to weakness, less mobility and greater chance of injury over time. The best way to reverse that process? Eat more protein and begin a resistance training program that builds muscle. 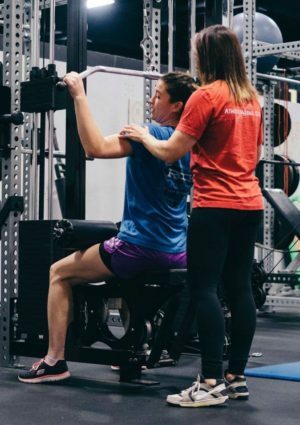 The Harvard Medical School recently published a recommendation that you "enlist a well-qualified personal trainer to help set up a detailed sequence and supervise your initial workouts to ensure you perform them safely and in the best manner. " Our trainers have the skills and experience to guide you back to health and strength. Multiple options are available to meet everyone's needs. We offer traditional one-on-one personal training, small groups of 1-4 people of similar fitness levels, large group bootcamp style training, CrossFit and HIIT. Ready to get strong again? Get in touch to schedule your free fitness evaluation!